Believe it or not it's that time again! 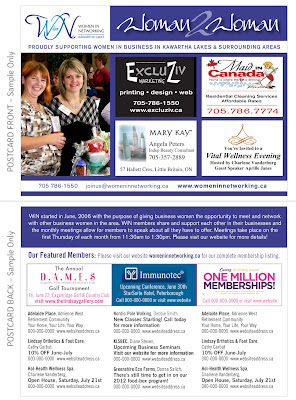 Our July WiN meeting is Thursday, July 5th. 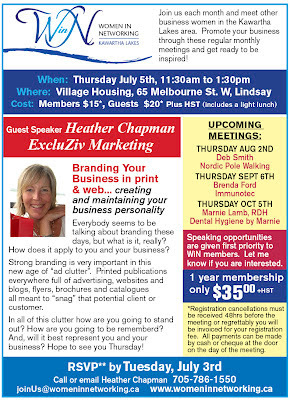 Our guest speaker is me, Heather Chapman, and I will be talking about "Branding your Business in Print and Web". Please let me know if you are planning to attend. Full details below. Please Note: Our August meeting is being held at Deer Run Golf Course on Elm Tree Road just 10min south of Lindsay. Think about booking the afternoon off and, after the meeting, shooting 9 holes of golf on a very "forgiving" course. I have no doubt it will be a fun afternoon. If you are interested in golfing after the meeting please let me know and I will block off some tee-off times so that we're all together. (9 holes - $20, Push cart - $4, Power cart - $18). Note: if you're up for it, the course is very "walkable". Looking forward to seeing all of you on Thursday! Here is the recap from last weeks meeting.. Thank you to Donna Salich for her very informative presentation on all the wonderful things offered at Greenshire Eco Farms - Sustainable grown food, permaculture and their equine-assisted learning just to name a few! Thank you to Susan Peirce of Sunrise Graphic Design for handling the 50/50 draw and to Deb Smith, Nordic Pole Walking for being the "bell" lady!